Home › Culture › education › Can HECS debt be privatised? It is difficult to imagine conditions under which this policy makes sense. But we are talking Hockeynomics here. 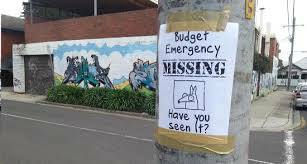 Remember the budget emergency which has suddenly gone missing? At the moment, HECS is a pretty good deal. Your debt doesn’t rise in real terms, you don’t start paying it back until you earn somewhere around the median full-time wage, and the repayment levels are not too onerous. ETA: Matt has kindly pointed out what ‘real terms’ means in relation to HECS debt. I said “the debt doesn’t rise in real terms.” It doesn’t. The ‘real’ bit there is important, meaning “the debt doesn’t rise in inflation-adjusted terms” or “the debt rises only by the CPI.” In your situation, the nominal value of your debt rose, but the inflation-adjusted value did not. ETA: So while the inflation adjusted value of my HECS debt was nomially the same the effect was that My debt did rise. When I finished University my base level jobs were too low paying for me to pay any HECS. Or if I did pay some I got it back when I did my tax return because I hadn’t earned enough overall. Which was nice for a tax return but annoying because I wanted the rotten thing paid off. Meanwhile it was growing at about 3% per year. Then gradually I got better paying jobs and began to chip away at the debt. Then I stopped work when I had my first child. I had only made a small dint in my debt but I was very proud of it. My debt was around $13 000 because I did two years of a science degree before switching to a 4 year education degree. Once I went on leave to have my baby my HECS debt started to accumulate again due to CPI increases. By the time I was earning enough to start paying HECS again (which was a few years since my first jobs post baby were under the HECS threshold) my HECS debt had risen above its previous level. So effectively all the money that I had paid off it was wasted. This is obviously going to continue to be an issue for women who complete their degree then take time off for child rearing before their HECS debt is paid. It will also affect any parent who wants to take significant time off, or work significantly less to share the childrearing if their income drops below HECS level. It will also affect anyone in contractual employment who doesn’t have a steady income throughout the year. This situation will only be made worse if HECS is privatised. The Liberals in Opposition accused Labor of being involved in class war, but changes to HECS will disproportionately affect people from lower socio-economic backgrounds and may be the difference between some people going to University or not. I’m afraid I have to take issue with your nark. Thanks for the clarification. I will amend the post. How are loan repayments ‘wasted’? Your debt is less than it would have been if you had not made those repayments. Ergo, wasted not (but probably wanted not as well). It felt like a waste. Yes my debt would have been more had I not made any payments but it certainly felt like I had wasted my time. The loan system is privatised in Scotland, where education (in it’s most recent formation) is free (to Scots), except for a £2000 endowment that you pay at the end of your degree and your living expenses. Your loan is for living expenses and is based on your income (poor people get grants plus loans, rich people or young people with rich parents get less loans and are expected to top it up from their own/parent’s wealth. Loans are tightly regulated, so they have a low and capped interest rate (but not insignificant) and you only pay when you earn over the threshold and it’s on a sliding scale. It is also paid through the tax system for most people (ie it’s taken from your wages each month). They also reclaim it from you if you work overseas (although you have to be willing to make the payments and it’s hard to chase you, but theoretically you could default if you don’t). And, it expires when your 65 or die, so if you haven’t paid it off then too bad for the Loans Company. I don’t have any particular investment in it being privitised (and generally disaprove of such malarky), but it doesn’t seem to make any difference to its operation. The only change they made to the system when they privitised was to raise the capped interest rate slightly to 3%, but they offset this with the disappearing debt at 65 thing. I think the reality is that most people of medium income take most of their lifetime to payoff quite small amounts of capital and so that 3% interest makes it financially viable, despite the fact that the rich will pay quickly and a few people will not pay it all back. Anecdata is not data, but I remember when I was going to Uni I had friends who were concerned about running up a debt and not being able to pay it off. I am interested to know if the debt becomes privatised does it affect your credit rating? Could having a HECS debt make it more difficult to buy a house or get a loan for something? Or even a credit card? Lots of potential pitfalls. It doesn’t impact on your credit rating in Scotland, and you also can’t get rid of it if your bankrupted in most circumstances, so it’s a weird debt in lots of ways. It basically acts as a tax for most purposes. When they raised the tuition in England to £9,000 a year, there was concern that people wouldn’t want to take on the debt (that’s £27,000 before your living expenses loans). But, it hasn’t impacted on the numbers so far, although it’s too soon to do a proper socio-economic impact (ie how did it effect people from different backgrounds). I think if it was at the going interest rate it would be a huge liability however that would put people off. HELP debts, which is probably the better term (HECS-HELP debts are for students who had a Commonwealth funded place — ie, the government paid outright for a portion of their tuition and they borrowed the remainder, which is what most students do — and FEE-HELP for students who must pay or borrow the entire cost of tuition) are already supposed to be disclosed to lenders and thus taken into account by them. Since the terms are much more generous than private debt currently, presumably they do not impact loans as much as equivalent private debt, and so having the debt accrue interest at market rates would make that worse.